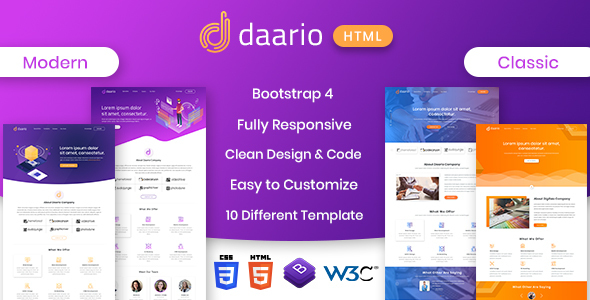 DAARIO – Corporate portfolio HTML Template is Creative and modern responsive layout which also looks great on mobile and tablet devices. The main point of focus is represented by home page slider which scales down automatically depending on your screen resolution. There are 5 Modern and unique Templates contains blog page with comments, About US, Services, Our Team, Contact us, Elements, 404 pages, coming soon pages and contact page with map of location and working contact form. illustrations are created by us and we give full rights to use them wherever customers want to use on website. Thanks for purchasing! Please Give Us 5 Star Rating! If you need support, please send me an email using the contact form on my user page. I usually respond to support requests within 24 hours so please feel free to contact me with problems of any kind or even simple questions.